Stone Arch Books, 9781496552419, 128pp. 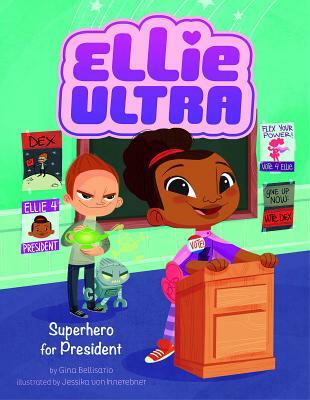 Ellie Ultra is a leader. As a superhero, she kind of has to be. So when the opportunity to become class president comes up, it's a no-brainer that Ellie will run. The only downside is that devious Dex Diggs, her arch nemesis in the school, is going to run too. After an Ultra Genie wish machine gets into Dex's hands, Ellie gets a glimpse of what the world will be like if Dex takes over. She has to do everything she can to make the world a better place and undo evil wishes, even if she isn't president.